PBS KIDS Announces First Cat in the Hat Christmas Special: THE CAT IN THE HAT KNOWS A LOT ABOUT CHRISTMAS! ARLINGTON, VA, November 1, 2012 – On November 21, PBS KIDS will premiere the first-ever Cat in the Hat Christmas special, THE CAT IN THE HAT KNOWS A LOT ABOUT CHRISTMAS! Set to be a new holiday family tradition, this adventure follows the Cat, Nick and Sally on a journey around the world to help a lost reindeer find his way home in time for Christmas. Through this new multiplatform program from the hit PBS KIDS series THE CAT IN THE HAT KNOWS A LOT ABOUT THAT!, kids and parents will explore natural science through new content on-air, online and beyond. On-air special: Sure to be a holiday favorite for the entire family for years to come, this adventure finds the Cat in the Hat, Nick and Sally on a journey around the world to help a lost reindeer find his way home to Freezeyourknees Snowland in time for Christmas. On the way, the Thinga-ma-jigger breaks down, and they depend on a variety of animals – from African bush elephants to bottlenose dolphins to red crabs – and their remarkable abilities to help them make an amazing journey home. The one-hour special premieres on Wednesday, November 21 on PBS KIDS, with encore presentations throughout Thanksgiving weekend and in December (check local listings). Online Game: In the new online game Freezeyourknees, Follow Me, Please!, Ralph the Reindeer is a long way from Freezeyourknees Valley. The Cat in the Hat is giving the lost reindeer a ride home when the Thinga-ma-jigger suddenly loses its power and makes an emergency landing. Only you can guide Ralph back to his family in time for Christmas – with help from some amazing animal friends! Freezeyourknees, Follow Me, Please! offers players three levels of game play, each level its own animal-themed “Follow Me” challenge. Grounded in an animal science curriculum, THE CAT IN THE HAT KNOWS A LOT ABOUT CHRISTMAS! game will be available at PBSKIDS.org/catinthehat starting November 7. DVD: NCircle Entertainment just released THE CAT IN THE HAT KNOWS A LOT ABOUT CHRISTMAS! on DVD. The DVD will be available at retail nationwide so that families can continue watching throughout the holidays. For more information, visit NCircle: http://www.ncircleentertainment.com/the-cat-in-the-hat-knows-a-lot-about-christmas/843501004227. Random House Children’s Books Titles: To extend the PBS KIDS Christmas special into a reading experience, in September 2012, Random House Children’s Books published a selection of accompanying titles in trade paperback, Golden Book, Step Into Reading and activity book formats. Featuring the same fun take on science that parents have come to appreciate in all THE CAT IN THE HAT KNOWS A LOT ABOUT THAT! 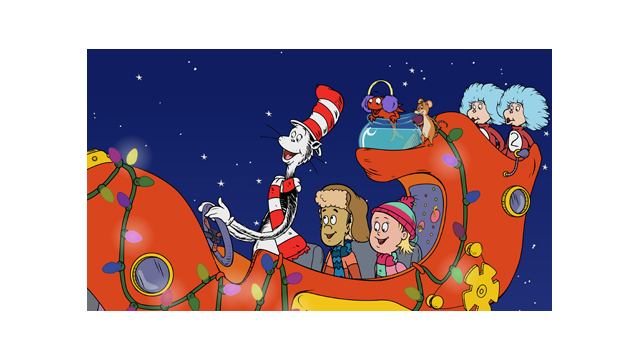 episodes, children can now watch and read with the Cat in the Hat this holiday season! A Reindeer's First Christmas/New Friends for Christmas by Tish Rabe; illustrated by Joe Mathieu and Aristides Ruiz In A Reindeer's First Christmas, narrator Ralph – a yearling caribou – tells how, with the help of the Cat in the Hat, Sally, Nick, and some new friends, he makes it home in time for Christmas and pulls Santa's sled! In New Friends for Christmas, Sally and Nick learn that with a little help from family and friends – and a spare mini-Thinga-ma-jigger –it’s possible to accomplish almost anything! A Very Crabby Christmas byTish Rabe; illustrated by Dave Aikins The Cat in the Hat has just received a special invitation! He and Sally and Nick have been invited to Mervin the Crab's Crab Christmas Ball on Christmas Island. But soon after the Thinga-ma-jigger lands on the island, chaos ensues when Crab Nine (aka Sandy) goes missing. Is Sandy lost or injured? Will the ball go on as planned? Home For Christmas by Tish Rabe A Step Into Reading adaptation, Home for Christmas is written for children who are ready to read independently. From the Cat in the Hat's Christmas Eve Party through his mishaps while attempting to return a young reindeer home in time to pull Santa's sled, readers will be introduced to a herd of elephants with an uncanny ability to smell water, a pod of dolphins who can communicate across far distances, and a single-minded army of Christmas Island crabs – all of whom demonstrate how working together is the best way to solve a problem, and how home is the best place to be for the holidays! Happy Holi-Doodles! Get ready to ho, ho, ho, ho with Nick, Sally, and the Cat in the Hat! Based on the PBS KIDS show THE CAT IN THE HAT KNOWS A LOT ABOUT THAT! and the upcoming Christmas Special, this yuletide Doodle Book invites kids to color and also to create fun holiday images. Walkin' in a Sticker Wonderland! With 48 pages to color and an entire sheet of hologramatic stickers, Christmas has never been so colorful and bright! THE CAT IN THE HAT KNOWS A LOT ABOUT THAT! launched on PBS KIDS in 2010 and is part of PBS KIDS’ continuing commitment to helping kids ages 2-8 build the key STEM –science, technology, engineering and math – skills that will prepare them for success in school and in life. A team of science and early childhood experts developed the curriculum for the series, each episode of which begins with a question posed by Sally or Nick. Although the Cat in the Hat knows a lot of things, his insatiable curiosity to learn more about the world leads to adventures with Sally and Nick in his one-of-a-kind Thinga-ma-jigger, a marvelously Seuss-ian contraption that sprouts wings, pontoons, booster rockets, skis, and just about anything else needed to find the answer. The inquisitive gang travels to the bottom of the sea to observe giant sea worms, zips to the rain forest to visit animals living in kapok trees, and shrinks to bee-size to visit a hive and learn how honey is made. Guided by the Cat in the Hat, the kids figure things out by observing, collecting and managing clues, making connections, constructing and evaluating theories and having discussions – all in a preschool-appropriate manner. Produced by Portfolio Entertainment Inc. and Collingwood O’Hare Productions, in association with Dr. Seuss Enterprises, Random House Children’s Entertainment, Treehouse, and PBS KIDS, THE CAT IN THE HAT KNOWS A LOT ABOUT THAT! is based on Random House’s best-selling Beginner Book collection, The Cat in the Hat’s Learning Library. ABOUT RANDOM HOUSE CHILDREN’S ENTERTAINMENT, LLC Random House Children’s Entertainment, a division of Random House Children’s Books, is dedicated to expanding the reach of children’s stories beyond books to a variety of traditional and new media platforms. Drawing from the rich and varied library of books published by Random House, the company’s mission is to create, produce and distribute quality projects for young people that will educate, enlighten and entertain. Random House Children’s Books is the world’s largest English-language children’s trade book publisher. Creating books for toddlers through young adult readers, in all formats from board books to activity books to picture books, novels, ebooks and apps, the imprints of Random House Children’s Books bring together award-winning authors and illustrators, world-famous franchise characters and multimillion-copy series. Random House is also the longtime home of the beloved and bestselling Dr. Seuss books, which continue to make learning to read fun for millions of children everywhere. Seussville (http://www.seussville.com), the official home of Dr. Seuss on the Web, is the place for children of all ages to play and learn with Dr. Seuss's wonderfully whimsical books and classic characters. Random House Children’s Books is a division of Random House, Inc., whose parent company is Bertelsmann AG, a leading international media company. ABOUT NCIRCLE ENTERTAINMENT/ALLIANCE ENTERTAINMENT CORP Established in 2006, NCircle Entertainment specializes in the sales, marketing and distribution of children’s entertainment. NCircle currently distributes over 300 DVD titles from popular animated and live-action children’s programs, primarily geared to a preschool audience, that combine high-quality production, entertainment and educational values. As part of its commitment to making a positive difference in all children’s lives, NCircle is a proud supporter of K.I.D.S. (www.kidsdonations.org/), whose efforts to date have reached over 65 million kids globally with new products valued at over one billion dollars.